Audio Book: The Emotionally Destructive Marriage is now available in audio book format from ChristianAudio.com! Are You Discouraged With Your Growth? Last week I worked in my garden for the first time all season. I pulled weeds and planted some Zinnia and Columbine. I know I’m late. I should have done it a few weeks ago but other more urgent things took my time. This morning I went out to check on their progress and I’m bummed. I don’t see any signs of growth. Not one tiny poke through the soil and I’ve faithfully watered them, doused them with Miracle Grow and the weather has been great. I keep hoping maybe there is something I can do to make them mature a little faster. Any tips? God’s creation has a lot to teach us about how growth takes place. For example, a human embryo takes nine months of womb life to develop into a healthy infant. No matter how well an expectant mother cares for herself and her unborn child, she cannot hurry her baby’s development. If she neglects her care she can do damage to her unborn child’s growth but she is powerless to speed it up. A Chinese bamboo plant takes five years of faithful watering and fertilizing to see any signs growth. Yet sometime during the fifth year, the tree sprouts and then grows ninety feet in just six weeks. But without the regular watering and fertilizing by the farmer, the growth won’t take place. What can we learn from nature’s lessons? I see people who get frustrated when they don’t see progress in their emotional and/or spiritual growth. They read their Bible, go to church, hire a coach or see a counselor and are part of a small group. But they still find themselves struggling with selfishness, envy, anger, insecurity, feelings of unworthiness, and the fear of man. We become impatient with our seeming lack of emotional and/or spiritual growth and conclude that what we’re doing isn’t working and are tempted to give up. Please don’t do that. Although you can’t control how fast you grow, you can do things that make your growth more likely. 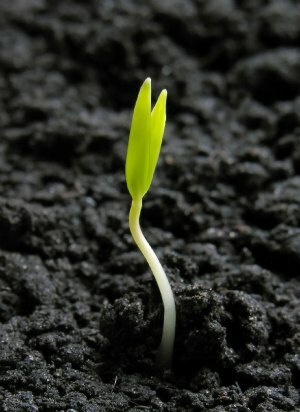 Just as a farmer faithfully tills the soil, waters, pulls weeds and fertilizes so that that his seedlings will grow into healthy strong plants, we too can do things that make it more likely that our growth will occur. And, in the same way if a farmer neglects his crop and does not do those things, he will be less likely to reap a robust crop. 1. Plant seeds. It seems obvious but if we don’t put good things into our mind we can’t expect growth. If a farmer never plants his seeds, it doesn’t matter if he waters, nothing will take root. Take time to read God’s word but don’t just read. Reflect and ask yourself, “Is there one thing here that I can practice this week?" 2. Pull the weeds. One summer I got too busy and didn’t pull any weeds from June all the way through August. I have three large perennial gardens and by the end of summer, they looked ugly. There were flowers in there but they were crowded and hidden by all the gigantic weeds. Pride and selfishness are like weeds and have deep roots. When they rule our life, all the good fruit that God might be growing can’t be seen. Weed regularly and you may see more growth that was hidden by the weeds. 3. Fertilize. Most plants do better when you feed them. In the same way we need to nourish ourselves as well as allow others to nourish us to ensure our best growth. Hebrews 3:13 says, “Let us encourage one another day after day lest any one of us become hardened by the deceitfulness of sin.” When we are blind to it or refuse to hear the constructive feedback of others, we won’t grow like we should. Invite trusted people to give you feedback. Is a History of Abuse Doomed to Repeat Itself? Question: Leslie, the counselor we, or mostly he, is seeing told me that when hubby acts one way in public and different at home, it’s because he feels safe with me. My husband was physically, emotionally, and sexually abused as a child. I had no idea to what extent, but neither did I know that those experiences would hurt our marriage. Leslie, could you explain here, or on another post, why this happens. Ladies, those of who have been posting, does your husband have childhood trauma? It would be interesting to know. Answer: I have mixed feelings about answering your question. I want to tell the truth, but I don’t want you to hear from me that someone who experiences a traumatic childhood is automatically destined to become a future abuser. There are many people who have experienced some kinds of horrific abuse in childhood and have not become abusive. I also want you to understand that having empathy and compassion for the pain your husband experienced as a child is not a valid reason to continue to allow yourself to be abused or mistreated even if your counselor says he feels “safe” with you. It’s true: hurt people often hurt people. When a child is consistently subjected to traumatic abuse throughout childhood, the basic developmental growth processes that make that child capable of healthy adult relationships become arrested. For example, we know that when a child’s primary caregiver is incapable, unwilling, or unable to regulate or absorb her infant’s distress, the child suffers extreme anxiety and as an adult he or she is unable to regulate his or her own affect (calm themselves down, name and process their feelings with compassion, modulate their anger appropriately). 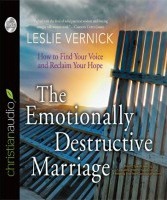 The Emotionally Destructive Marriage Audiobook by Leslie Vernick. Plus see the winners of the previous giveaway! You can’t put it into words, but something is happening to you. Your stomach churns, your heart aches, and the tension in your marriage is making you feel weary and a little crazy. The constant criticism, disrespect, cruelty, deceit, and gross indifference are eroding your confidence and breaking your spirit. Trying harder to be a perfect fantasy wife won’t help fix what’s wrong your marriage. Discover instead how you can initiate effective changes to stop the cycle of destruction and restore hope for the future. To win, please use this form to submit your name and email address by midnight on Sunday, June 22nd. The winners of Invisible: A Novel by Ginny L. Yttrup are: Cassandra D. and Cynthia W.
June 28 UNcommon Woman Conference hosted by Excellent Living at McLean Bible Church in Vienna, VA.
and unhealthy people. What I have learned through Leslie's guidance will not just help me through the last few months of divorce proceedings but will help me through life. I am forever grateful for Leslie's ministry and her investment in my life!"